Sticking to a budget is something many of us have trouble with. From spending money going out to lunch or indulging in a daily coffee from a nearby café, there are always reasons why we are unable to save. Are you struggling with daily finances? 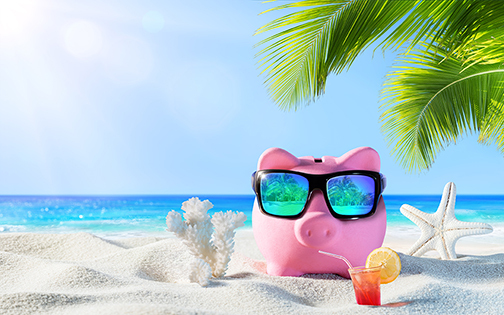 We understand that money issues influence many aspects of our lives, so we want you to feel more confident when it comes to the basics: spending, borrowing and saving. 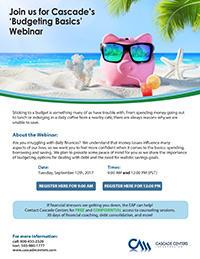 In this Webinar, we plan to provide some peace of mind for you as we share the importance of budgeting, options for dealing with debt and the need for realistic savings goals. If financial stressors are getting you down, the EAP can help! Contact Cascade Centers for FREE and CONFIDENTIAL access to counseling sessions, 30 days of financial coaching, debt consolidation, and more!